Hello all, yes I have been MIA as usual but to be honest I really haven’t been doing much sewing lately. I refuse to sew any garments until after the baby is born (gotta get this big belly under control first!) and as far as sewing baby clothes we have received soooo many in our showers and from our family that the motivation is just not there. As a teacher my time is already stretched thin, and with baby preparation, baby classes, baby showers, thank you notes, doctor appointments, etc.. its all I can do to just kick my feet up and relax at the end of the day while I can. I will save my baby sewing for Halloween, which I am super excited for! Imagine the possibilities.. I have however made a couple of stuffed animals for the baby’s room. We are doing sort of a sock monkey/sock animal theme so I wanted to make a sock animal addition. 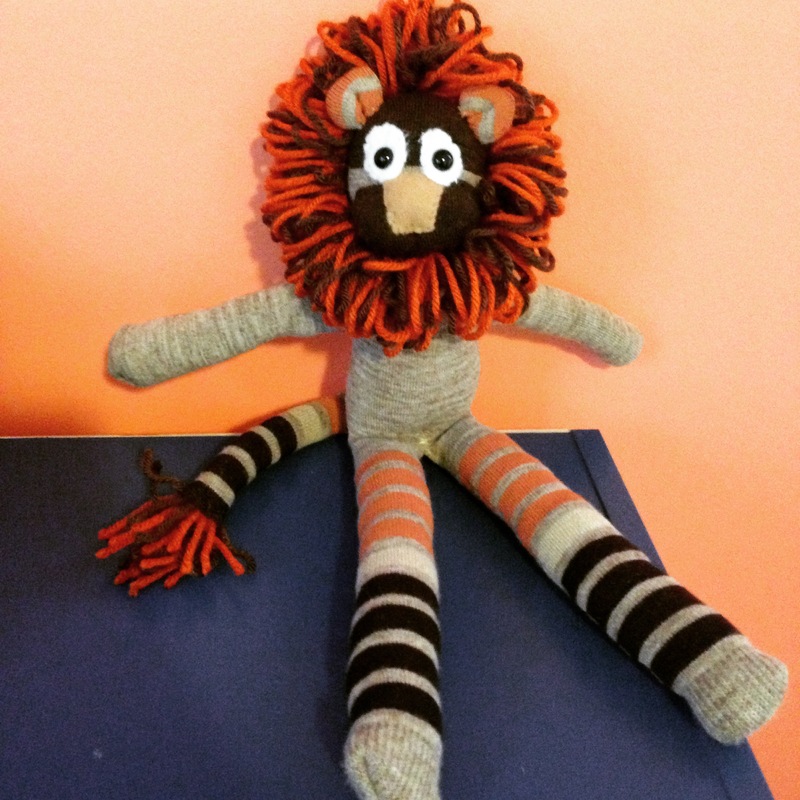 I found this adorable pattern online for a sock lion and I had to give it a go. Mine isn’t quite as cute as the one in the tutorial, in fact I’d say he is bordering on the line of slightly ghetto, but that’s okay. It is the first sock animal I have attempted and I found him to be a little challenging, mostly in all the hand sewing and hiding seams, particularly the stuffing seam at the crotch. I tried to use a slip stitch for this part but the hole was just gaping as this point (that’s what she said) and the sock was wearing thin so I had to just make it work. I also chose to use safety eyes since I had a bag of them from previous projects and I wish I had just stitched some eyes on instead, as they are a bit too big for his head. The most fun part was obviously the mane, this involved wrapping yarn around a piece of card board and sewing it together in a string and attaching around his face. It is the final touch to making him an actual lion instead of a skinny cat! Despite his short comings, he fits in nicely with the other sock animals in our baby’s collection. I may or may not attempt another, there are so many great sock patterns out there! 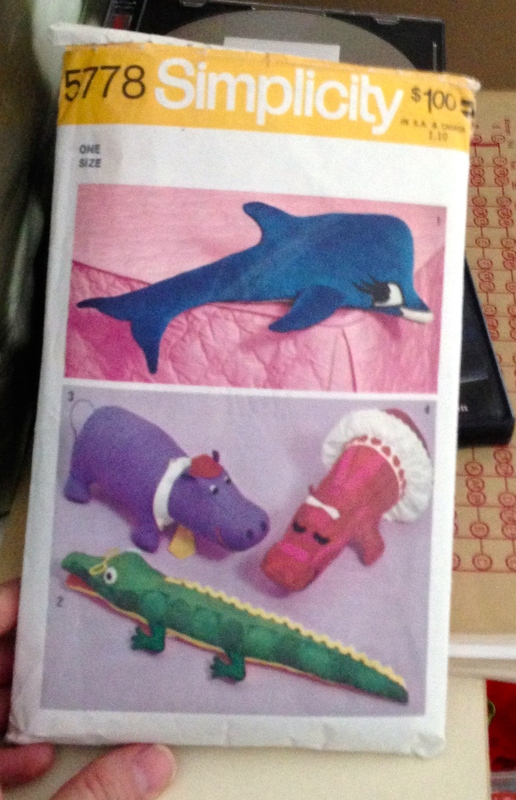 The second animal I made was a big crocodile from an old pattern found at a yard sale Simplicity 5778. I have previously made the hippo for another friend for her baby which turned out pretty cute so I thought we’d give the croc a go. There were a lot of pieces to cut out for this gal (I made a lady crocodile) but I found that it all pieced together nicely with no major issues. The only trouble I ran into was inserting the mouth piece, somehow it ended up a bit too small so I had to alter it and add some length to fit in the head. I made a few changes along the way, mostly just to give the croc some more personally. I gave her eyelashes and again used the safety eyes I had on hand. 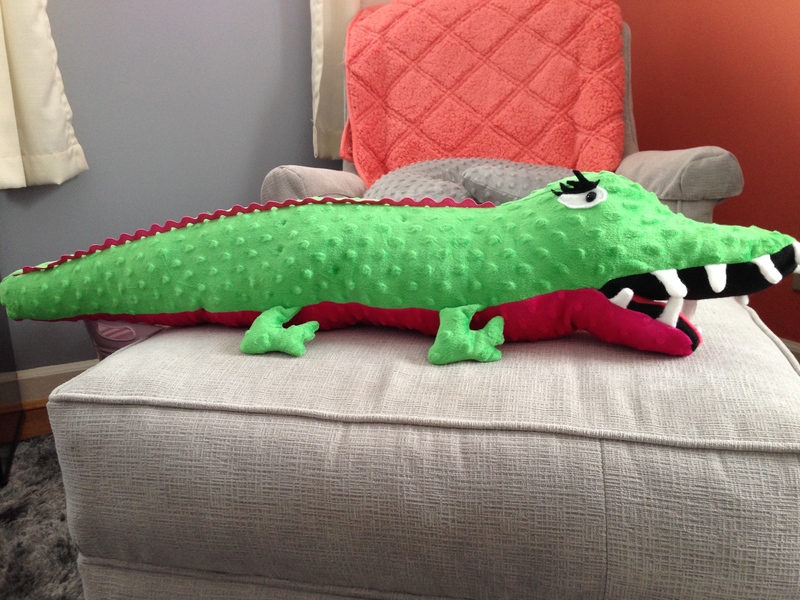 I put a tongue in her mouth, and for some reason the pattern only had the gator with two teeth which I thought would look strange. I made a bunch of other teeth but still fell a bit short, she has a “big bubba” grin, at least its a bit comical. I used soft minky fabric in bright green and hot pink, and pink rick rack for her back scales. She is pretty large, almost three feet long. Since she is so big I am planning on using her for monthly baby photos to use for a scale of how big the baby gets. The nursery is just about ready and stocked with plenty of diapers and wipes and supplies, I will post some nursery pictures soon! We only have three more weeks until her arrival, it is pretty surreal to imagine having a daughter in such little time. We are getting both nervous and excited! Getting sleep while I can…zzz..
You look great. Congratulations to you and your family. Great job on the zoo animals. Thanks lady! It is definitely starting to look like a zoo in there! Congratulations! I’ve got 2 daughters and my eldest just turned 12. It’s exhausting but time flies and before you know it they are wearing your hand-me-downs! Oh I can’t wait until she is old enough for cute hand made dresses and sewing projects that I will be too old to wear 🙂 Thanks lady! Thank you! I have made an octopus and a hippo for other friend’s babies, so I thought this would be cute but different! Omg you look adorable!! Pregnancy looks fantastic on you!!! 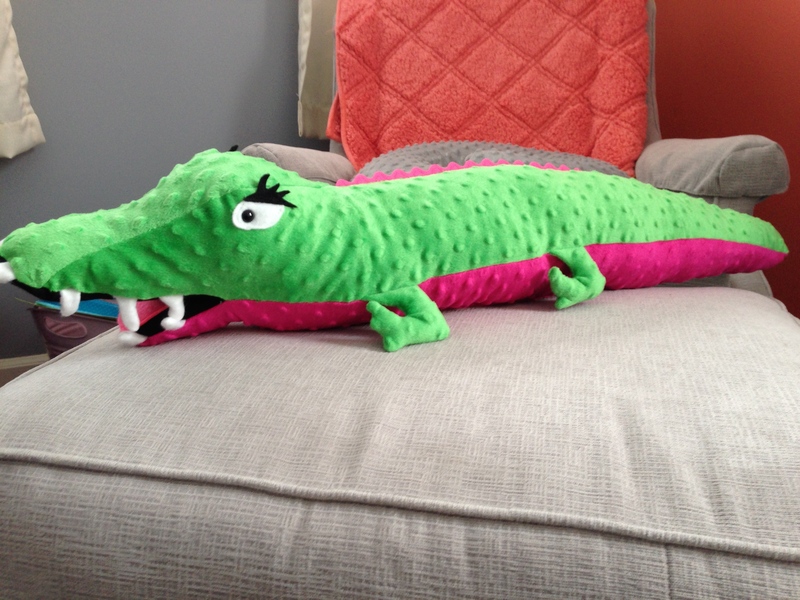 The crocodile is so cute, what a great little pattern. Thank you! I sure am ready to not be pregnant though! whew! That crocodile!!! It’s so, so cute!!! Good luck with your last few weeks!!! Thank you! Its getting scary close! Cute stuffies, and look at that adorable belly! Here’s wishing you the best when it comes to L&D and hope you don’t have too much longer to wait. Woohoo for full term! Yes! 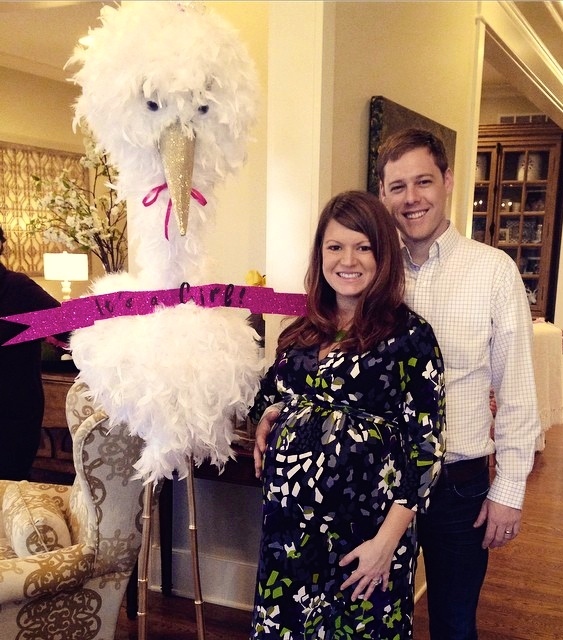 Its about two more weeks now (assuming she doesn’t make an early appearance). Thanks for the well wishes! Hey, was thinking about you; how’s mamahood going? Looks like your little lady will be 2 in a couple of months! It is going great! Funny enough we just had our second baby and she was born on her big sister’s birthday. Life is busy but maybe someday I will have time to get back into sewing and revive this blog! How are you? Wow! TWO BABIES now?! Double congrats! Life sure moves fast, eh? And what are the odds of them sharing a birthday? Crazy! I’m pretty good. Finally finding the time to blog and sew more. We’ll see how long this gumption lasts!